I’m super excited because tomorrow is an unexpected day off for me! I’m planning on sleeping in (hopefully), a run and some good food! Unfortunately Farmer Ben is working ALL weekend (the joys of being married to a chef) but I’m sure I’ll be able to entertain myself. It’s been a long time since I’ve done of these posts…so I thought I’d catch you up on the things that are currently all over my brain… Nothing sponsored, just sharing some things I am loving lately. 1. Kombucha. I’ve always liked it, but lately I’m really digging it…blame it on the season! 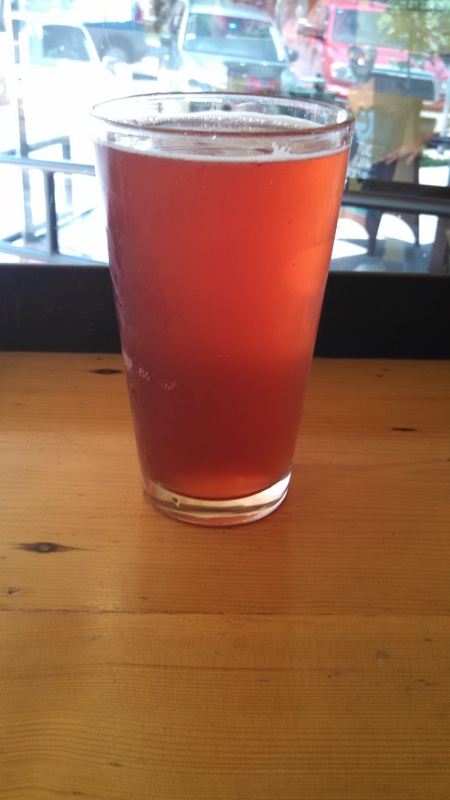 I was super excited on a recent trip across the lake; Farmer Ben and I got to try a sour cherry variety on tap… it was DELICIOUS! I also picked up a bottle of Grapefruit ‘bucha and I’m a big fan! 2. Unspoken. I went to a concert in May and I’ve been obsessed ever since. The Unplugged album has been on repeat in my car for I don’t know how long… Bury the Workmen is one of my favorite songs (not on the Unplugged album but still a good one). Grace is another favorite. So goooood! I love the harmonies! Anyway, long story short, you should probably check them out! 3. Greens! 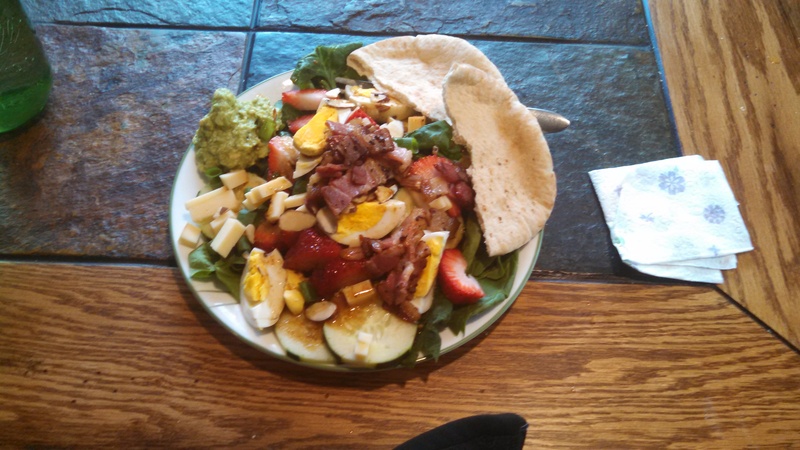 Again, blame it on the season, but I am loving my veggies lately (especially giant salads that allow me to cover said veggies with other things…like bacon and guacamole). 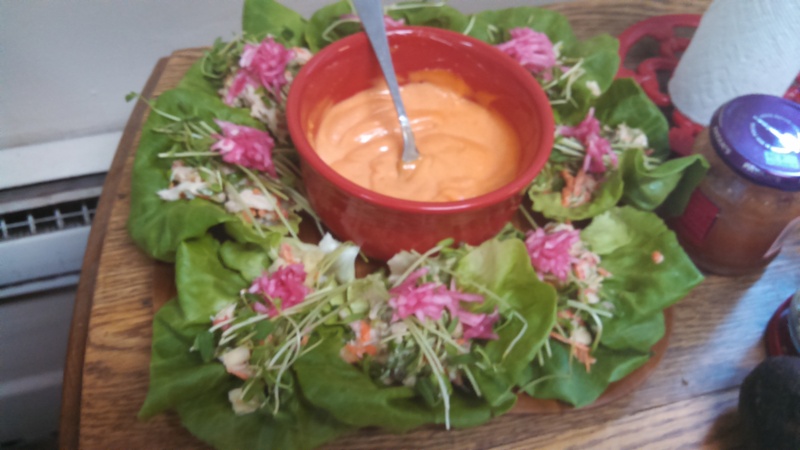 These are lettuce wraps Farmer Ben made, filled with REAL crab salad, Sriracha mayo, pickled radishes, fresh herbs, pea shoots and other delicious things…. 4. Book Club. I’ve always loved to read but had never been to a book club…I started my own book club back in November and it’s been such a gift! This month’s book is Cold Tangerines by Shauna Niequist and I am already loving it. 5. The News. Blame it on the recent prison escape a few minutes from my home, but I have been spending way too much time reading/watching the news lately! Not that I don’t like to be informed, but it’s been a bit of a problem as of late! 6. My job. I GET to do what I do and it’s awesome. I’m super blessed. The people (especially the teens!) that I interact with on a day-to-day basis continue to amaze me and inspire me. I know that it isn’t always sunshine and roses… but for the most part, I have a pretty fantastic job! This Sunday, we are taking a group of kids to watch some fireworks… how fun is that?! Your Turn: What are you loving lately? Anything I need to know about? !